MONTREAL - It's been whispered about for years, but now the government's anti-corruption squad says it has proof that organized crime has infiltrated the construction industry and influenced political parties. The report by former Montreal police chief Jacques Duchesneau and Quebec's anti-corruption squad and obtained by Radio-Canada and La Presse comes after a year-and-a-half-long investigation. The UPAC (Unité permanente anticorruption) report, which does not name any firms or individuals, found that prices are regularly hiked by engineering consulting companies and that contractors regularly overrun their costs. It said Quebec's Transportation department is laidback about challenging prices, and when it challenges an invoice, the companies often launch a civil suit because they are aware the department will often settle out of court. Even more damning, the report alleges that Transportation Ministry employees were paid to provide companies with privileged information so those businesses could win government contracts. Newly appointed Transportation Minister Pierre Moreau addressed the report Thursday afternoon, even though he hadn't seen it at the time. 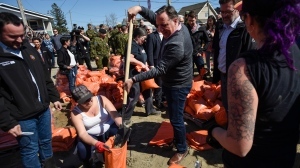 "I would like to see the accusations and I would like to see, as far as I'm concerned as Transport Minister, measures that are implemented within the department to make sure what Mr. Duchesneau is telling us won't happen again," said Moreau. The report also established a direct link between the road construction industry and secret financing of political parties. Investigators referred to disturbing "influence peddling." An extract from the report obtained by Radio-Canada read: "According to the testimony of a former political adviser, parties are always knocking at the door of the large engineering consulting and construction firms." The report confirming allegations of corruption does not come as much of a surprise, especially since Quebecers have been clamouring for years for a full scale public inquiry into corruption and collusion in the construction industry. Maud Cohen, the president of the Quebec Order of Engineers says corruption likely goes far beyond dealings with the provincial Transportation Ministry. "It doesn't just concern the MTQ (Ministry of Transportation), which is only the little part that has been addressed by the report. It might concern also municipalities and other organizations that that manage major infrastructures," said Cohen. "Whether they are politicians, whether they are civil servants, whether they are contractors, or they are engineers, I want them to be sued if they are acting in a criminal way," said Moreau. However the minister does not think the public should see the report just yet. "I don't want to interfere with the police investigation that is going on, so I don't think it would be wise to make the report public." "Our feeling that the transparency will be required and the report will need to be published," said Cohen. Ultimately, the media took the question out of the government's hands. Radio Canada released the report in its entirety Thursday evening on its website. "We have discovered a deeply-rooted and clandestine universe, of an unsuspected scope, that is harmful to our society - in terms of security, the economy, justice and democracy," the report states. It claims the road construction industry is run by "a small circle of professionals and business people who specialize in bending the rules in place to enrich themselves at the expense of taxpayers." However, it is admitted in the report that the extent of organized crime's involvement in the industry is difficult to gauge. "A large number of Quebec construction businesses maintain links with criminal organizations," it states. "We therefore strongly presume that some among them have an influence on the contracts handed out by the government, and that they have even set foot on the (transport) ministry's work sites. Even though it is impossible to evaluate the extent of it, we can suspect how much the mafia exerts a presence and its influence in the construction industry." The report finally validated the longstanding political battle being waged by Parti Québécois Leader Pauline Marois to hold a public inquiry into the construction industry, a call that has fallen on deaf Liberal ears for years. Now, she finally has the ammunition she's lacked for so long. "There are too many problems that are presented in this report and they don't have a choice," Marois said. The Action démocratique du Québec and Québec Solidaire also called for a public inquiry, while Montreal executive committee member Michael Applebaum said Mayor Gérald Tremblay would also support the idea. This story has been updated from its original version. Get ready for another summer of roadwork.